Border Walls, Compromise, "National Emergency" or Another Shutdown? I think it is pretty clear the Democrats will not make a deal or compromise. I also don't think Trump will compromise. Only two options I see. 1) Reportedly, the Democrats HAVE offered additional border barrier money, in exchange for a reduction in the cap on detention facility beds, particularly for interior detention purposes (away from the border itself). That proposal is apparently not acceptable to the Republican negotiators, but its existence makes it clear that it is not accurate to say Democrats aren't willing to compromise (though it may well be accurate to say the two sides won't agree to a compromise). Where's the "national emergency? Apprehensions were anywhere from two-and-a-half to six times greater every year of the GW Bush administration than they were in 2018, yet neither President Bush nor any Republican leader in Congress asked for a national emergency declaration during those eight years. 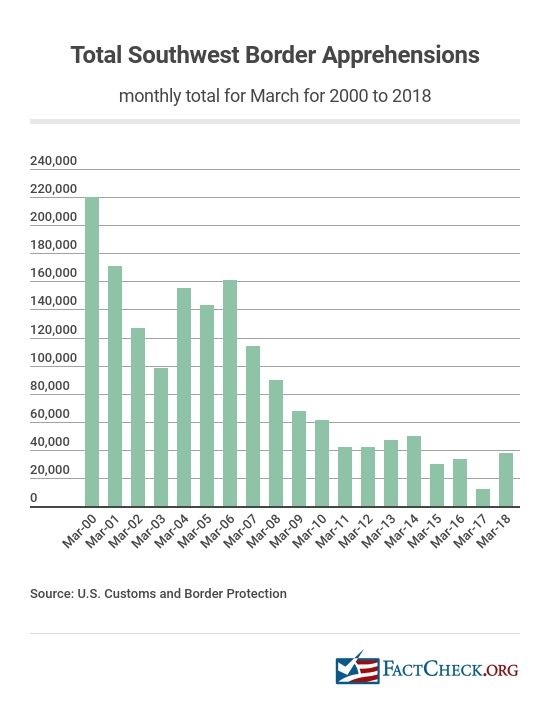 If it's a national emergency now, when apprehensions are anywhere from 60%-80% lower than they were then, what was it during the Bush43 years? A catastrophe? And the president claimed credit for the fall in apprehensions during 2017. To my knowledge, the administration did not change its policies during 2018. So should the president accept blame for the 2018 rise in apprehensions, for this "national emergency"? First, Democrats have offered what they knew would be (and should be) rejected by any rational person. So no, they are not compromising. It is all smoke and mirrors. We have had a national emergency for decades and it continues. 40,000 apprehensions is still a ton of apprehensions. It is a problem that needs to be dealt with. Your contention that what the Democrats offered "should be rejected by any rational person" is, of course, your partisan political spin, as is my response - that the president and Republican congressional leaders have offered a proposal that should be rejected by any rational person - my partisan political spin. Neither of our spins changes the facts of the matter, in this case which include that for Democrats to offer any money for new border barriers is a move away from their default position. Whether it's the "right" move or a move "any rational person" would accept is not relevant to whether they have moved, and hence demonstrated a willingness to compromise. Given that you believe we've had a national emergency "for decades," I assume that means you condemn President Bush, as well as Presidents Clinton and Obama, for their failure to declare one during their terms? And I also assume that you condemn President Trump for not declaring one in the first two years of his presidency? If it's a national emergency now, when apprehensions are anywhere from 60%-80% lower than they were then, what was it during the Bush43 years? A catastrophe? President Trump claimed credit for the fall in apprehensions during 2017. To my knowledge, the administration did not change its policies during 2018. So should the president accept blame for the year 2018 rise in apprehensions, that is, for current state of the "national emergency" which you believe has been going on for decades? Yes, a catastrophe. They didn't deal with the problem at all. I don't think the President should accept blame for 2018 because of the courts blocking many of their measures they have tried to put in place thanks to Democrat lawsuits. I accept but disagree with "catastrophe" as your description of the circumstances back then. As for the president's not accepting blame for the 2018 rise in apprehensions after he took credit for the 2017 decline in them: What specific policies and procedures did the administration have in effect in 2017 - which therefore helped the president claim credit for that year's successes - that courts blocked in 2018 - and therefore led to 2018 showing a rise in apprehensions over 2017? Off the top of my head, I can't think of ANY policies that were in effect in 2017, but were blocked in 2018. Please provide a list and links. Tonight, Republican Sen Richard Shelby of Alabama announced that House and Senate conferees have reached an agreement in principle to avert a government shut down. So much for your assessment that the Democrats "will not deal or compromise," reformed. Now the question is will the president "deal or compromise." https://townhall.com/tipsheet/bethbaumann/2019/02/11/preventing-a-shutdown-congress-comes-to-an-agreement-on-border-security-n2541202 We don't know anything about the "deal". Nothing is set in stone. It is a principle agreement only. In this case, the principles tell us something about the deal. From reporting I heard last night, the agreed-to framework includes $1.375 billion for barriers, no cap on the number of detention beds, but a funding amount that currently provides for 40,000-45,000 such beds. Surely there are many other details, but barrier financing and the number of detention beds were among the negotiation sticking points, and those seem to have been resolved by negotiators. I doubt the President will sign that agreement. 1.375 billion is ridiculous. Why not just fund it and take the President's DACA offer? Answer: Because this isn't about a wall, this isn't about DACA, this isn't about the American People, it is about Democrats hating Trump. What will it be? The clock is ticking away and time is run-in out, for a deal or compromise, to build a wall, Trump promised, with money from Mexico. Initial reporting this morning, both before and after the press "availability" in the Oval Office, is that the president is leaning toward signing the compromise, then reallocating money from other areas - flood and fire disaster relief in California, and hurricane relief in Puerto Rico, of example - to build additional barriers. That may not happen - goodness knows, the president has few if any guiding principles when it comes to legislation - but at the moment, I expect him to sign the compromise. What loss would he have if he didn't sign it? I doubt any of those things would happen by him not signing the bill.